If you're a native to Montreal chances are you feel pretty connected to our city. As Montrealers, we love Montreal. We’d go to bat for this city. But more importantly we LOVE Montreal summers. I teamed up with Ombrelle Canada to showcase a few of my fave destination to visit this July… sunscreen not optional! Food trucks hit the streets of Montreal rolling a few years ago, but one of the best places to enjoy these food trucks is at the Olympic Stadium every first Friday of the month. That means this Friday! The other awesome part about the trucks is you can also find them scattered throughout the city around parks and town squares like Square Victoria in Old Montreal, park in front of Bell Center, around Mont-Royal and so many more. 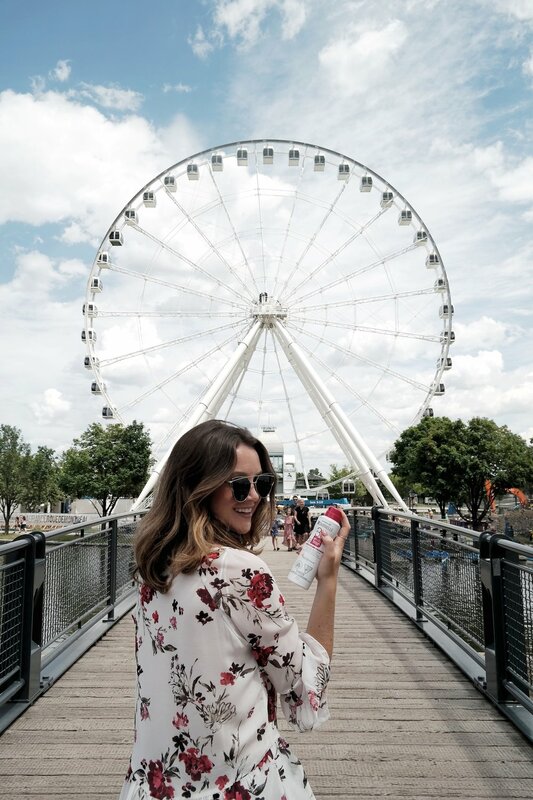 Montreal now has one of the largest ferris wheels in Canada located on bonsecours island in the old port. It was designed to be used as an observatory to the city. The ferris wheel takes you 60 meters high, with views of the river, the city and the mountains. The ferris wheel is new this summer, but is said to be remaining throughout the colder months with air-conditioned cabins in summer and heating in winter. Explore the area around the wheel for coffee or sangria since they are open everyday from 10am-11pm. If you ever feel like skipping the gym just because its beautiful outside and you don't want to miss those days of rays, think again. Trekfit has over 10 locations in the Montreal area where you can do outdoor circuit training. How perfect! Access to the space is free and in line with Trekfit’s mission, to promote a healthier lifestyle through regular physical activity by offering accessible, safe and comprehensive training circuits. Their website also offers access to different training groups and information on circuits at a Trekfit park near you. 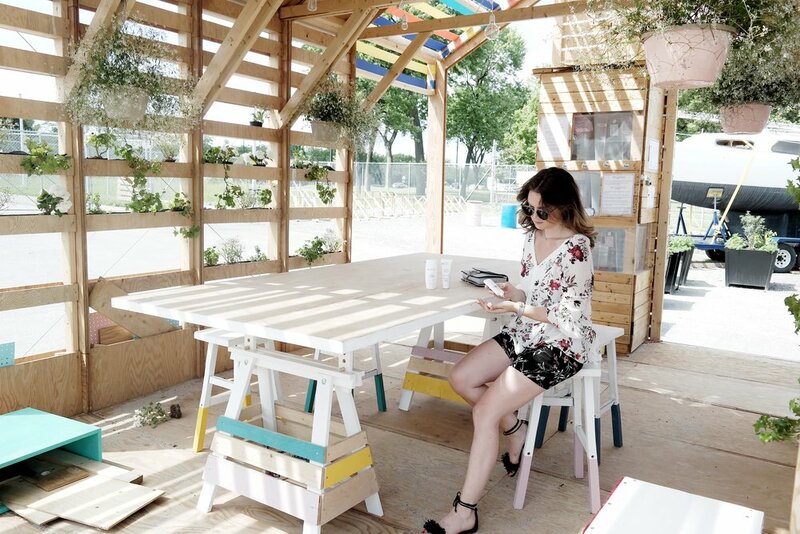 One of the best spots in Montreal to spend a sunny Saturday afternoon, Village au pied - du - Courant is a new take on summer activity parks, said to be a “experimentation and development of new practices in design, entrepreneurship and the arts. Located right at the edge of the Saint Laurence River and the island of Montreal, this location is meant for the lounge loving, sun soaking, easy summer days. With local food, beverage and accessory vendors on site changing year after year, you never know what is in store. Thelocation is accessible Thursday-Sundays. Check out their website for activity scheduling as they often have yoga classes, specialty vendor events, and the best part, everything is Free! Because one of the only things Montreal is missing is a beach, we build one. Back for all the beach festivities this year after a summer on strike (this is Montreal after all) the clocktower beach is open again for summer 2017. We may not be able to swim at this man made beach in the Old Port, but you can certainly tan and sip a cocktail or two at some of their swanky summer festivities…. with your sun protection of course! Wearing Le Chateau head to toe.